The New Era is a stand-alone expansion for 51st State. It contains more than 80 new cards and new, fifth faction – The Hegemony – violent band of criminals. New rules of direct interaction allow players to Invade each other and sign Deals with opponents’ locations. New options and decisions have opened for players. The game is aggressive and even more engaging than 51. State. This is a whole new adventure in postapocaliptic world of Neuroshima. The New Era presents the highest standard of production with wooden components, with new victory points board, with polished and improved iconography. The New Era may be combined with 51st State or may be played as a single game. 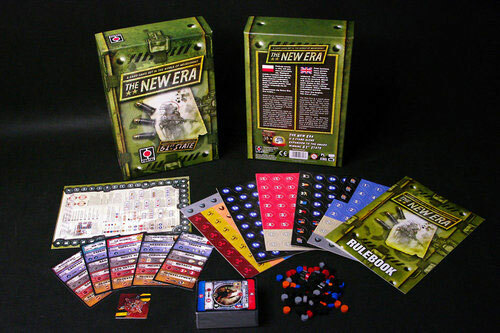 You don’t need to have a copy of 51st State to play The New Era. This game is so good. I say that based on replayability and variety. The base concept is simple. You are a faction and that faction comes with a set of actions. the actions are then used to play the cards you have in hand. But each card can be played in three different ways, depending on which action you choose. So even if you start with the same hand to games in a row, the opening move won’t be the same. As you can imagine the tablue you build will grow and you get more resources and actions as the game progresses as does your opponent. But that is a good thing, because you can use your opponents cards as well. But great games comes at a cost. The rulebook is confusing, and there are many small fiddley rules. But I’m telling you up front, it worth it. It’s one of the few games me wife will request a second round of. Even after loosing. Add a Review for "The New Era"